Unspoken is Centricity Music's newest signing. Like many artists we've been hearing about lately, Unspoken has been an independent band for a few years, bringing fan favorites to the table with their signing to a national record label. Get To Me is the band's debut EP, and it reflects on the contemporary rock band's lead singer Chad Mattson's powerful testimony. Not only did God deliver him from an alcohol addiction, He also revealed His plan to Chad on a mission trip to the Dominican Republic, where he met Unspoken's guitarist Mike Gomez. Because of that, Get To Me contemplates the intense love of God toward us in a very fun way. Acoustic and electric guitars combine nicely in the EP's opening track, "Run to You." There is a slight Spanish feel to the background, reminding me of Salvador's older works and, in parts, Jimmy Needham's funky hits. Chad's vocals are superb, as well, especially the fast-paced lyrics he sings in the chorus: "There's nothing left to do but run to You/ and if I fall on my face, I fall on Your grace/ I've got no excuse, I run to You." Another highlight of the track is the comfortable bridge: "I can never let You down/ 'cause I've never held You up/ You take me by the shoulders and You hold me up." With nice pianos and a soft contemporary sound, "Just to Get to Me" is a tempo-bridge between "Run to You" and the single "Who You Are." With nice background vocals, it speaks of how God goes way out His way sometimes to get our attention and change us: "Sometimes You shatter dreams/ You tear down walls/ You wake me up when I'm half asleep/ just to get to me..." A little slower comes Unspoken's first radio single "Who You Are" backed by gently stroked piano keys. It encourages the listener to choose Jesus, walk through the door of freedom and "change who you are." I especially enjoyed the powerful lyrics of the chorus: "You can never fall too hard, so fast, so far that you can't get back/ when you're lost, where you are is never too late, so bad, so much that you can't change who you are/ you can change who you are." This track is a powerhouse! "You've Got Love For Me" is a very fun track, my personal favorite off the Get to Me EP. The Salvador and Jimmy Needham comparison definitely stands in this track, it's funky message speaking of God's never-ending love for us. I also loved Chad's higher and emphatic vocals in the bridge, borrowed directly from the Psalms: "How precious are Your thoughts/ so precious are Your thoughts of me/ how precious every one of Your thoughts." You can really tell that Unspoken has fun playing music through this track! Last, but certainly not least, is "Lost," a track that accentuates Chad's soft vocals that, here, sound like Bart Millard from MercyMe's. It also boasts on behalf of Unspoken's resonating lyrics, not only sharing more of Chad's testimony of deliverance, but also speaking right to the lost listener's heart that when we can't find our way back home, God's love has already found us. It is a fantastic ending to the Get to Me EP. I love Unspoken's sound! Get to Me is a fantastic introduction to this promising group. 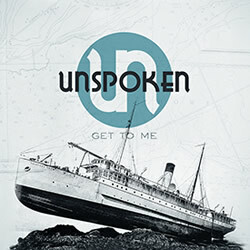 With two extremely upbeat and fun tracks and three moving ballads, Unspoken has done more with their debut EP than most bands could do in a couple of albums. I will definitely be following this new Centricity group and I hope to them garner some more chart-topping radio singles, awards, and acclaim! listen 2 them all the time @ home!!! !